This entry was posted in Blog News, Jessica Lacher-Feldman. Bookmark the permalink. We hope that the Cool@Hoole blog will serve to several purposes — to show off and highlight new items, to tie into exciting events, exhibits, happenings, initiatives, and news about the library, and to serve as a venue and forum for questions and to build a greater understanding of the who, what, when, where, and why of the special collections library! Here is a detail of the Tiffany stained glass window you will see upon entering our library. It was installed permanently in our building, Mary Harmon Bryant Hall, in 1993. 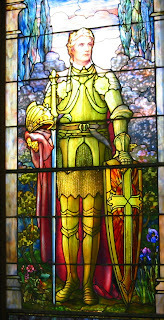 Donated by the Alabama UDC in 1926, it is a signed Tiffany window featuring several elements that Tiffany developed including confetti glass (as seen in the hydrangeas behind the knight). An excellent article on the window was published by Alabama Heritage.